Acharavi is a new, modern and developing resort with all the amenities of a small town. The main street is dotted with bars, shops and restaurants, and you’ll find even more along the little roads leading to the beach. As well as the usual souvenir and gift shops there is a post office, banks, a dentist, doctors and pharmacies, hardware stores and flower shops plus a couple of large supermarkets. Acharavi is a good place to shop for local handicrafts such as gold and silver jewellery, things made from the local olive wood and very good soap made from olive oil. Locally made ceramics, lace and embroidered linen are high quality, inexpensive and widely available as well as leather belts, wallets and bags. 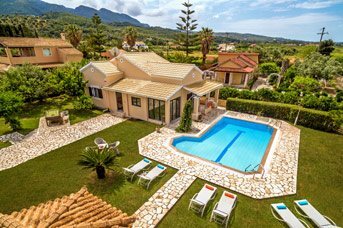 If you visit Corfu Town you will have a much greater choice.Acharavi is a new, modern and developing resort with all the amenities of a small town. The main street is dotted with bars, shops and restaurants, and you’ll find even more along the little roads leading to the beach. As well as the usual souvenir and gift shops there is a post office, banks plus a couple of large supermarkets. Acharavi is a good place to shop for local handicrafts such as gold and silver jewellery, things made from the local olive wood and very good soap made from olive oil. Handmade ceramics, lace and embroidered linen are high quality, inexpensive and widely available as well as leather belts, wallets and bags. If you visit Corfu Town, you will have a much greater choice. Eating out is one of the great pleasures of a holiday in Acharavi - your toughest challenge each night will be choosing! 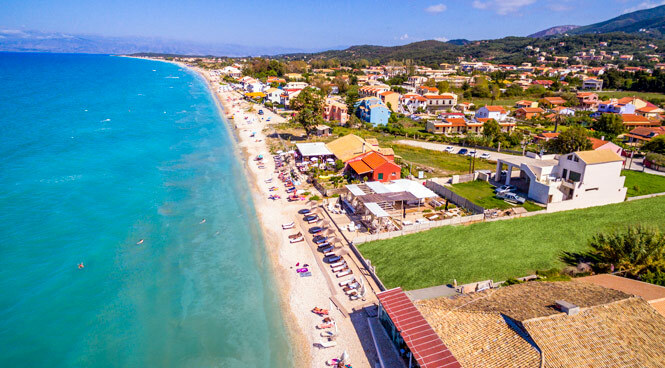 Perhaps the obvious choice for your first night is a beachside taverna at sunset eating traditional Greek food such as moussaka , stifado, and calamari. In town you can choose British, Italian or local food, but remember that wherever you eat, things are done at a much slower pace here and the locals can spend many hours over a meal. The Corfu Trail is a must for hikers and passes just behind Acharavi. These excellent walking paths have recently been cleared and the route is clearly marked with yellow signs, so there’s no chance of losing your way. The best way to fully appreciate the rugged and rocky coastline of northern Corfu with its small secluded bays and beaches, coves and caves is from the water. Why not pack a picnic and be the skipper of your own boat? It can be huge fun, great exercise and gives you a marvellous sense of freedom. You can drop anchor and swim with the fishes in the wonderfully clear waters. Many of the hidden little beaches along the coast can only be reached from the sea. If you arrive by boat, you might have a secret beach all to yourself. This is a brilliant way to explore and escape the crowds, and you don’t even need a licence! There is a boat rental place on the left hand side of the beach at Acharavi but if you are part of a large group, it’s worth considering chartering a motor yacht from the nearby resort of Kassiopi.